According to recent studies, the full adoption by EU SMEs of Cyber-Physical Production Systems (CPPSs) and their related service platforms and innovation business models will allow Europe to achieve the ambitious target by 2020 to have 10% of the GDP coming from Manufacturing & Services. 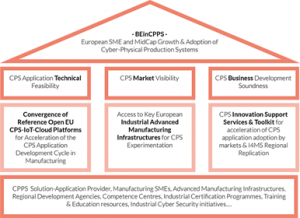 3) creating a network of Regional Manufacturing Digital Innovation Hubs, nurtured by CPS-oriented regional innovation ecosystems made of competence centers, manufacturing enterprises, IT SMEs and institutional stakeholders. In the context of BEinCPPS, Gradiant has won the first call for IT Applications Experiments. Gradiant is developing a discrete event simulator based tool as a Finite Capacity Scheduler to optimize all manufacturing orders and processes of a factory. Our simulator will act as a Cyber Physical Production System, monitoring the physical resources of a shop-floor to control the complete production chain and its performance. The proposed software will be designed with the ability to process a huge amount of data relating to both the state of the factory and its production processes, to learn and evolve with the experience and time, resulting in a Big Data based scheduler application to minimize the impact of incidents on productivity and optimize fabrication costs.